Based on an inquiry, I have dug a bit deeper into the IRS migration data and wanted to share a few facts and figures. First off, I am defining metro Oregon and rural Oregon for these purposes. 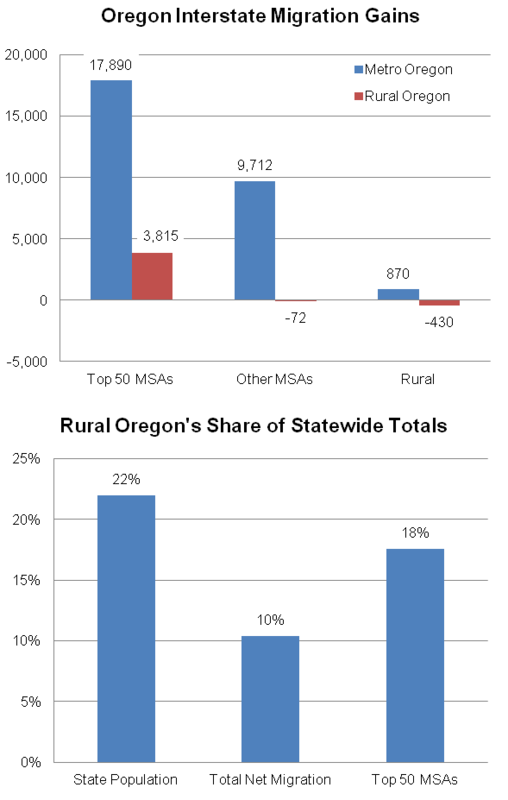 Metro Oregon are the 6 MSAs in the state and their associated counties: Portland, Salem, Eugene, Medford, Bend, Corvallis. All other counties are are non-metro, or rural for these purposes. I then look at migration from other states and whether the people moving in are from large cities (Top 50 MSAs in size), other metro areas or other rural areas. In terms of net migration, the majority of migrants come from large cities and chose to live in metro Oregon, however there are quite a few individuals who move into rural Oregon as well. 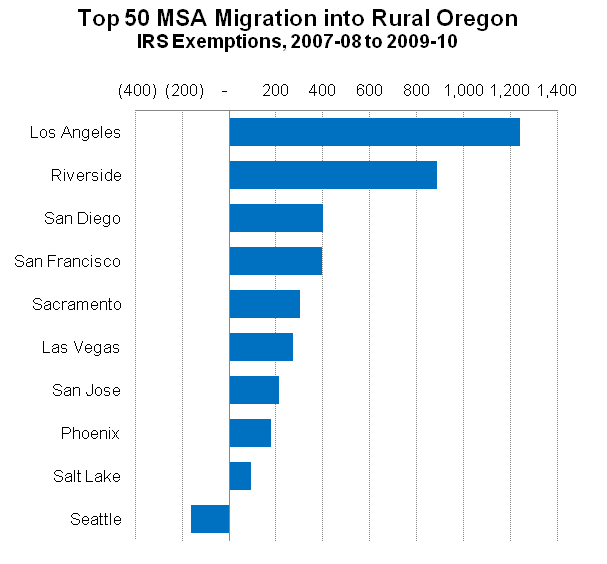 Overall about 10% of the state’s net migration over the years 2007-08 to 2009-10, based on the IRS tax return data, has been into rural Oregon. When looking at those moving from a large city the share is even larger, at about 18% of net migration from the nation’s largest cities. This is still a smaller share than the underlying population in the state, however rural Oregon is seeing larger gains from these big cities. So where exactly are these people coming from? Well, as expected, California, California, and some more from California. This has been the state’s general pattern of migration for a long time at this point — the northward west coast filter — and then losing some population to Seattle. The pattern is not much different if you look at the net migration to Portland as well. The vast majority of the influx is from California and also losses to Seattle, however you see an influx from the other large cities in the country. 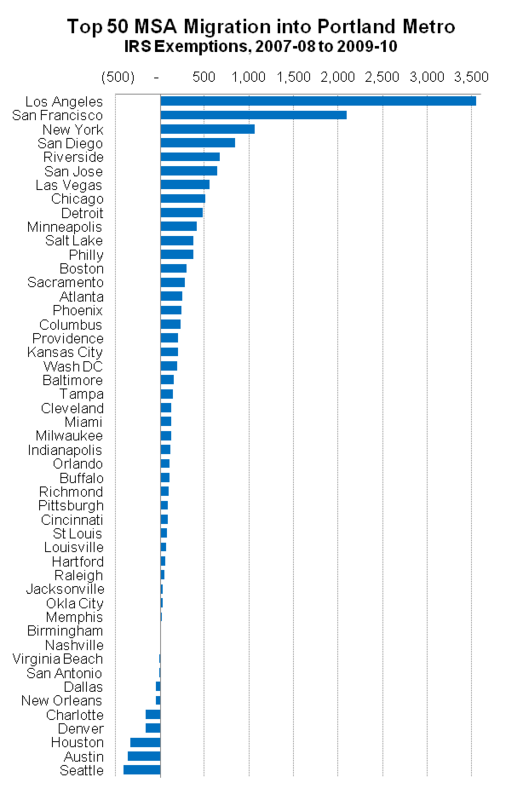 New York has the 3rd largest influx and Chicago, Detroit and Minneapolis are in the top ten too. 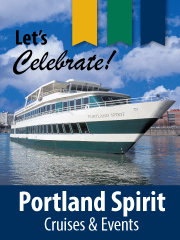 This goes back to the previous post that showed Portland Metro received 90% of the statewide gains from all other states outside of California and Washington. These gross flows are down from pre-recession levels, however the general patterns have remained the same, by and large. As the economy continues to recovery, our expectations are for the migration flows to increase and Oregon to continue to receive a net influx of migrants. This growth will likely be weaker than the strong population gains seen in the 1990s, however it is expected to be stronger than we have seen in recent years. Dallas, Charlotte, Denver, Houston, Austin & Seattle has significantly more job creation than Metro PDX. Out migration to these metro areas are no surprise. Oregon has a great quality of life compared to CA. As the economy improves, I would expect people from more challenging economic & expensive regions will increase net migration to Oregon. Welcome to the Beaver State! I do love Washington state’s tax system versus that of Oregon. For those wanting to be more keenly rewarded for their work effort than Oregon, Washington state definitely offers a superior alternative location. Just don’t earn your income in Oregon. I know many an Oregon state government retiree who has headed North shortly after retiring (although this may change with the Grand Bargain and other PERS reforms this year).